Preheat oven to 180°C/350°F. Peel and roughly chop garlic, onions, carrots, leeks, and celery. Melt clarified butter in a heavy-bottomed, ovenproof pot and sauté vegetables for approx. 5 min. over high heat. Deglaze with some beef stock, bring to a boil, then reduce heat and continue to simmer for approx. 10 min. Wash pork and pat dry. Mix vegetable oil, salt, caraway seeds, and pepper, then rub pork with mixture until coated. Place pork on top of vegetables in pot. Roast in the lower third of the oven at 180°C/350°F for approx. 60 min. Pour wheat beer over the pork and continue to roast for approx. 45 min. For the sauerkraut, peel and finely dice onion. Melt remaining clarified butter in a large saucepan set over medium heat and sauté onions for approx. 2 min. Add sauerkraut and white wine and simmer for approx. 5 min. Add bay leaves, juniper berries, and remaining beef stock. Season with salt and pepper. Reduce heat to low, cover with a lid, and simmer for approx. 30 min. Peel and quarter potatoes. In a large pot, bring salted water to a boil, then add potatoes. Cook for approx. 20 min., or until potatoes are knife tender. Drain and keep warm. Remove pot from oven, take out the pork and place it onto an oven rack. Turn up the heat to 200°C/400°F and roast the pork again in the oven for approx. 10 min., or until golden brown and crispy. Remove from oven and set aside. Pass pork drippings through a sieve into a medium saucepan and let simmer over medium heat. In a small bowl, mix starch and water to make a slurry, then add to sauce. Simmer sauce until thickened. 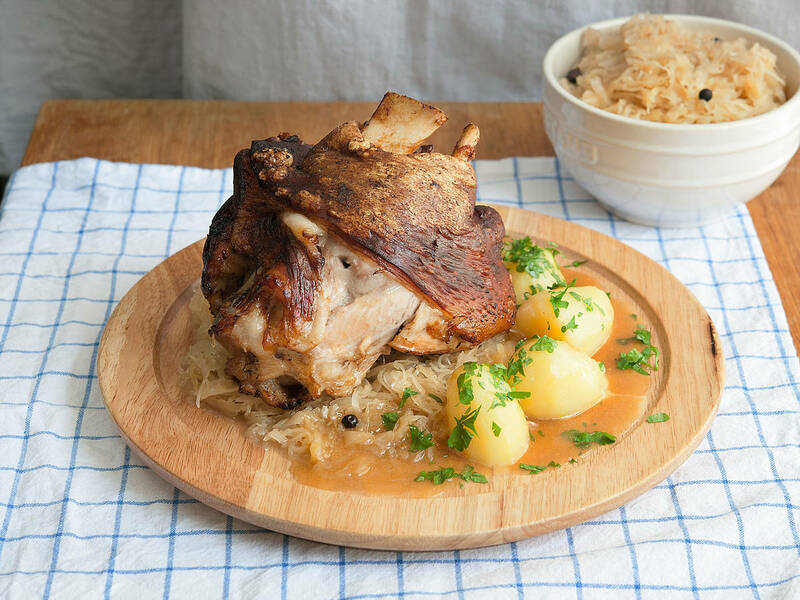 Season with salt and pepper and serve together with pork, sauerkraut, and potatoes. Enjoy!